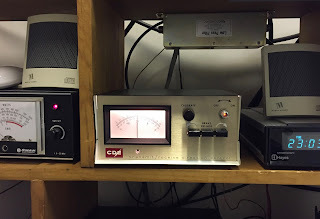 A $30 hamfest find - CDE Ham-II rotator control box. Proudly installed in the operating position. When I put up my tower in 2001, I'd had read enough on the TowerTalk mailing list over the years to know about the importance of brake delay. This allows the rotating parts on the tower to coast to a complete stop before the brake wedge on the CDE rotator design engages. Without it, the rotator comes to a sudden and abrupt stop, causing a lot of torsional stress and making the antenna and tower elements wave around unnecessarily. That repeated stress could end up causing failures over time. The original Ham-M design has no delay. Pushing the lever a little bit illuminates the meter and shows the position indication on the meter. A little more turns the rotator. The moment you stop pushing far enough to turn, the brake solenoid releases and engages on the rotator shell -- causing the sudden stop. The original design schematic, sketched out in 2001. Back in 2001, I came up with a very simple circuit. I had some Allied Controls 12 volt relays with a 1000 ohm coil. 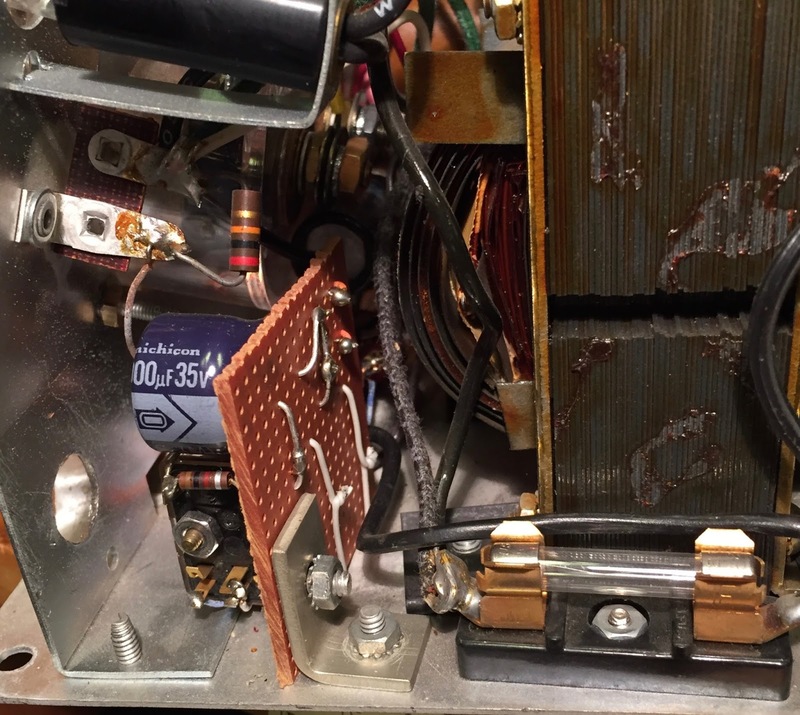 I figured I could rectify some of the AC from the motor terminals with a big enough capacitor to power the relay for a few seconds. I ended up drawing the circuit to the left. 50 volt PIV rectifiers might not be quite enough, so I wrote 100 v PIV on the design. I ended up using 1N4003 rectifiers which are 200 volt PIV. 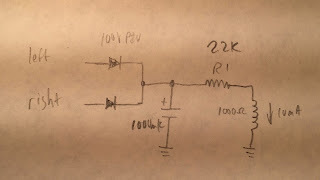 I estimated 10 mA of current is necessary to keep the relay closed. Since the left and right motor connections are about 30 volts AC, rectified this would be about 42 volts. 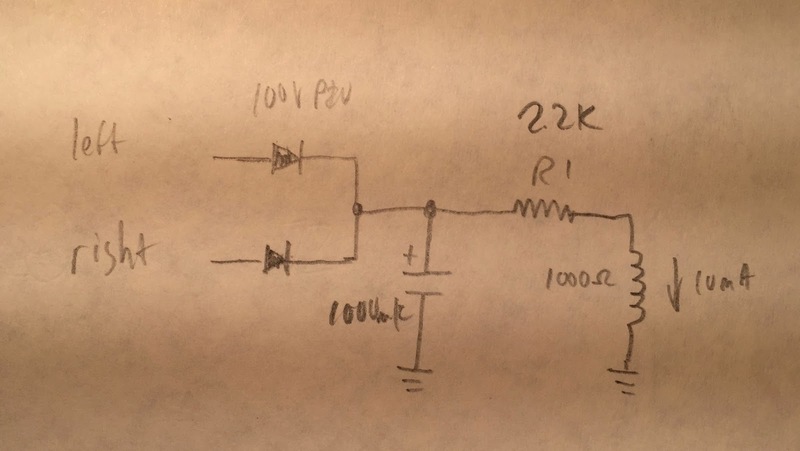 Putting a 2.2 K ohm resistor in series drops the voltage down to something less than 15 volts across the relay. All that remained was choosing the right sized capacitor. 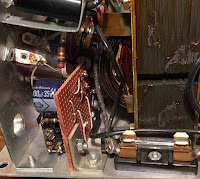 I had some 1000 uF low-profile capacitors in my junk box, so that was perfect, right? The RC value was around 3, so I expected a delay around three to four seconds. Imagine my shock when I actually built the thing and found it took something closer to fifteen seconds for the relay to open! Clearly, a lot less than the full 10 mA was necessary to hold the closed relay closed. I ended up modifying the circuit by placing a 1 K ohm resistor in parallel with the relay. This resulted in a delay closer to six seconds, which was just fine. The relay contacts are wired across the switch contacts for the solenoid, so the solenoid remains activated until the relay opens. Relay board shoehorned in control box. I built the circuit on a tiny piece of perfboard just a little bit bigger than the relay. Biggest problem was shoehorning it into the very crowded Ham-M control box. I figured I could mount it on a right-angle bracket just behind the meter. Wiring it into the circuit was harder. Assembled, the switch contacts of the Ham-M are inaccessible. I had to remove two sheet metal screws holding the meter panel to the base. That gave me access to the switch. After soldering up the leads, the meter panel goes back in place. This circuit has been in use since 2001, and has worked great. At a recent hamfest, I found a deal: a relatively pristine Ham-II control box for only $30. I bought it, brought it home and immediately determined it worked great. 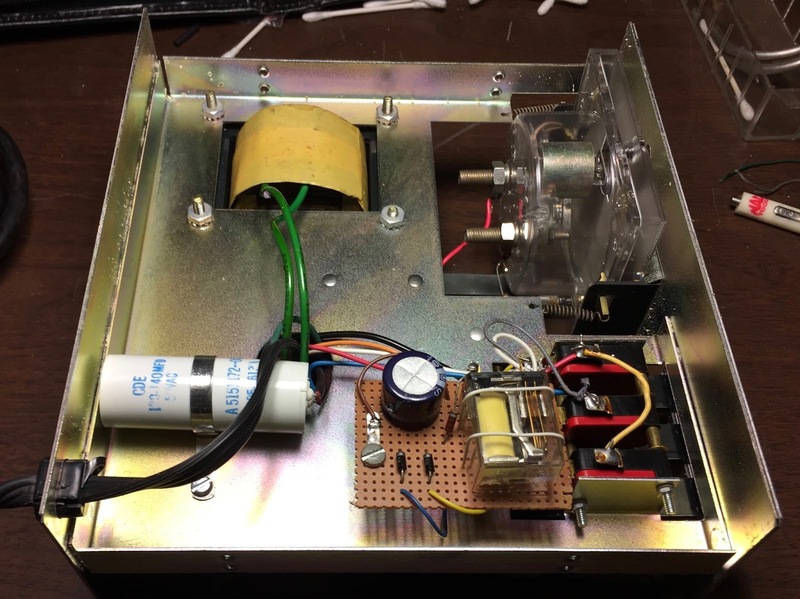 It would take the place of the Ham-M control box -- but it needed a brake delay. The Ham-II design has three buttons. The center button supplies power to the brake solenoid and must be pressed for any power to reach the motor windings. Proper technique would have you press the center button and hold it, then engage the left or right button, holding until the antenna had moved to where you want it, releasing the left or right button, while continuing to hold the brake in with the center button. 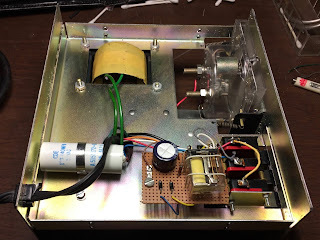 Ham-II control box with brake delay installed. However, if you just pop off the buttons, the brake wedge would slam into the rotator shell.... Not what we want. It wasn't hard to find the same parts in the junk box. Another scrap of perfboard, a few minutes of soldering, and the same circuit was again created. Mounting in the Ham-II box is a much easier exercise, since there's plenty of empty space. Because four of the connections are to the switches, I elected to mount the board on the bottom of the box, just behind the switches. A threaded standoff was used on an existing screw to hold the board slightly above the switch contacts. The standoff also supplies the ground connection. This circuit works great. In the Ham-M, the meter and lights would go off once the relay disengages. In the Ham-II, the meter and lights are on any time the box is turned on. It might be nice to have an indicator that the brake is engaged. Perhaps this will be a future addition.